This page is about the aircraft F4F-3. For other uses, see F4F (Family). The F4F-3 Wildcat is a Rank II American naval fighter with a battle rating of 2.7 (AB/RB) and 3.0 (SB). It was in the game since the start of the Open Beta Test prior to Update 1.27. The Wildcat is a beast when piloted well. Its strengths lie in its firepower and diving ability, but it also has the ability to out maneuver most aircraft in War Thunder. This gives you numerous options when dogfighting. The F4F-3 Wildcat is a good all-round fighter, though its top speed and rate of climb is lacking. It is good to go head on with opponents from other nations as their aircraft won't be able to withstand the damage that the Wildcat can deal, and the good protection for your pilot added to the overall resilience of the aircraft gives it some pretty impressive defence. Critical components located at front of aircraft (fuel, pilot, engine, controls). This aircraft is armed with only 4 x 12.7 mm machine guns. However, you can try to BnZ some Japanese fighters or aircraft as they are more lightly armored. 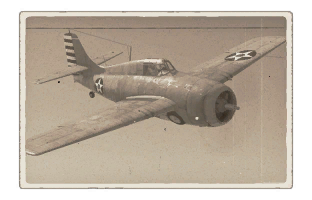 The Wildcat is an easy plane to fly. It is very manoeuvrable, and well-armed for its class. You can out turn pretty much all German and Russian aircraft, but beware that you don’t get sucked into a turn fight with any of the Japanese planes and especially the British Spitfire. The Wildcat will have a hard time downing planes simply because it has a low ammo count and the armament is only 4 machine guns, you will often get matched with the BF 109E-3 and F-1 which have powerful canons and a very good turn rate. The best way to use this cat is to BnZ since most of your opponent are less armored and are slower. You can also out turn some of the Russian aircraft, but if you cannot, simply dive away, you might rip the wings off. If your opponent, is too concentrated on attacking than protecting. 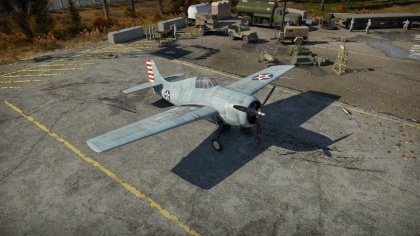 For firepower modules, outside of upgrades for the machine guns, the unlock of the module Mk.41 will allow the F4F-3 to mount two 100 lb AN-M30A1 bombs. During the early years WW2, the United States’ main fighter in its navy was the F4F Wildcat. One of the first monoplane navy fighters of it’s era. It served well in many battles, like the battle for Wake island, and most notably in the battle of Guadalcanal. It was a very reliable aircraft, however was constantly challenged by the infamous A6M2 and A6M3 Zero. However, most of the time skilled pilots like John Smith were able to out-dogfight more maneuverable fighters like the Zero and Oscar in those battles.